Has circulated a new Motorola Android phone with name is Motorola Quench XT3. 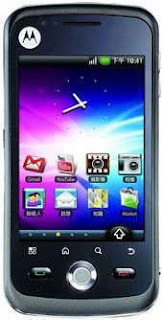 The phone is rumored to have named his company XT502 Greco although the specification has changed somewhat since then. Motorola Quench XT3 is a bar phone with a touchscreen display, similar to Motorola's original quench. Quench XT3 using the Android OS 1.6 Donut (and not as the rumored 1.2 eclair). This phone also features a 3MP camera.